During Metaxas’ dictatorship, works commence for the construction of an outdoor theatre between the western slopes of the Hill of the Muses (Philopappos) and the Hill of the Pnyx, next to the ancient Koile road. The project remains unfinished due to its enormous cost, the archaeologists’ reaction in view of the damage inflicted on the ancient landscape of the Hills and because of the subsequent outbreak of the war in 1940. Biris 1966, 330–331, 394–397; Dakoura-Vogiatzoglou 2004, 7. 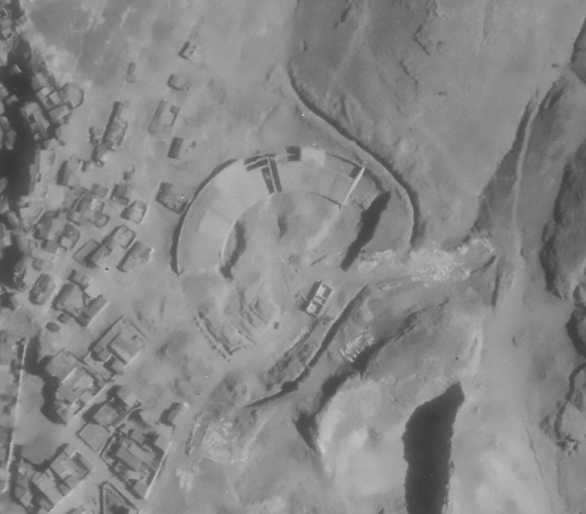 Part of the 1944 aerial photograph; the whole plan of the Bastias theatre is still visible, before the works for enhancing the archaeological site during the 1990s.